The statistic shows the sales of the leading men's shaving cream brands in the United States in 2018. In that year, Edge was the leading men's shaving cream brand in the United States with sales of about 81 million U.S. dollars. Shaving cream is used by men in order to facilitate shaving, creating a more comfortable process and a better finish. Although shaving cream was once applied with a brush, pressurized cans of shaving cream have been on the market since 1949 and now account for the majority of shaving creams used today. The majority of men in the United States prefer to purchase their shaving cream from multi-outlets. This is not surprising as shaving creams are not a luxury item but a common household good, with the average American only spending around 21.57 U.S. dollars on shaving needs annually in 2015. 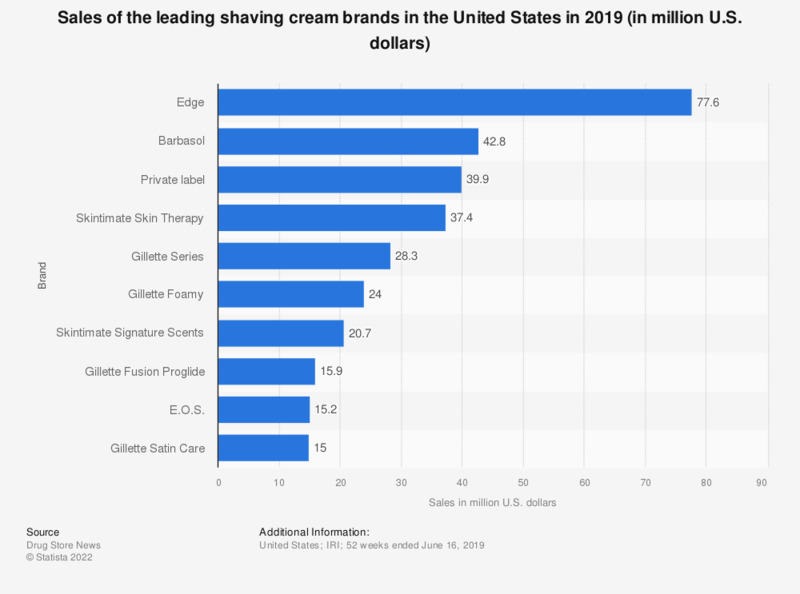 Edge shaving products, the highest earning products in the statistic above, are the second most preferred brand of shaving cream or gel behind Barbasol. Barbasol was invented in 1919 and was purchased by Perio, Inc. from Pfizer in 2001 who have attempted to maintain the brands market relevance. Personally, what form of facial shaving do you have most often?